Fitting a saddle is one of the rider's most basic concerns, and there are many important criteria to meet regarding the horse's comfort, the rider's position, and the optimal transmission of aiding between the rider and the horse. All horses have the same basic width of spinal column and angle of spine in relation to the horizontal. The height and shape of the wither, and the proportions of the ribcage vary quite dramatically between breeds of horse, but they still tend to fall into three basic types. Rocking is when the tree shape is incorrect i.e the angle curves too much, like a banana, and the whole saddle rocks back and forth with the horse's movement. Bridging is also when the tree shape is incorrect, but this time the angle doesn't curve enough and the saddle only contacts the horse's back at the back and the front of the panels. These places are then taking all the weight, and are likely to cause discomfort and pain due to the pressure points. Interestingly, the vast majority of saddles are built on the same mass-produced tree. This tree is not shaped to the horse's spinal column, due to short-cuts taken in the manufacturing process, and a basic lack of understanding of the shape of the horse's back by saddlers (who are usually not riders themselves). It is held together with metal struts and features recessed stirrup bars. 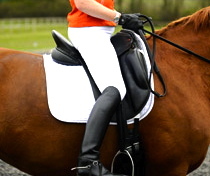 Stirrup bars are designed like this for the comfort of the rider, but for the horse they invariably become pressure points, and often horses have hardened lumps and even white hairs on the corresponding place on their back. When fitting a saddle, we feel that it is important for the it to have a tree that provides a consistent weight-bearing structure, so the weight of the rider is distributed evenly. We know that for the horse's spine, the tree structure is crucial, it can't be improved with different panel types or padding. Like the tale of the princess and the pea, an incorrect tree shape will always impinge on the horse sooner or later. We have had the good fortune to discover a little-known design of saddle that addresses beautifully the above issues of fitting a saddle. Strada saddles (above) have a tree made with carbon fibre and wood and they are designed to fit the universal spinal shape of the horse. They are made in different widths i.e the panel angle alters to accommodate the different types of horse, and they fit all horses with reasonably healthy musculature like a glove. 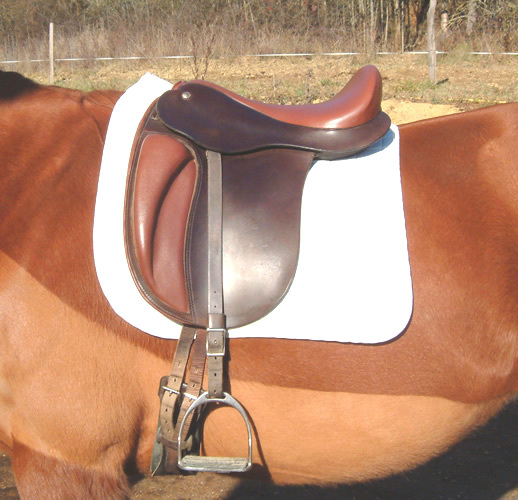 These saddles also have panels made of thermo-reactive memory foam so that although they mould themselves to the individual horse's back, they return to their original shape after use, unlike wool-filled panels which invariably take on the unevenness of the horse's back over time. Once you've understood what your looking for when fitting a saddle, you also need to consider where you are actually placing it on the horse's back. When you place your saddle on the horses back and slide it back, to find the right place, the main thing to be aware of is the position of the scapula in relation to the saddle. When a horse moves his leg forward, the scapula rolls back, and if there is a saddle in the way, eventually the cartilage of the shoulder joint will be damaged. To feel this, cup your hand over the top edge of the scapula and get someone to lift the horse's leg out - you will feel how it comes back. For this reason the saddle must be placed so that the scapula is visible and you can watch it moving back and forth unrestricted. Horses with the saddle on their shoulder like in this photograph, will start to shorten their stride in front to try and avoid the friction. We find that in general saddles very often come forward against the shoulder during work, even if they are placed correctly to begin with. Go to Using a crupper to keep the saddle in place for more on this. Keeping your horse happy with his saddle can be quite a challenge. If he has had a damaging saddle previously in his life he will anticipate that he is going to be hurt again, and even if you have subsequently taken care correctly fitting a saddle, it can be difficult to convince him otherwise. Always put it on as gently as you can and do the girth up very gradually. If you are putting it on a young horse get him used to the saddle-cloth first, and don't do everything in one day. It's better to assume that he need's more time than go by a lack of reaction. Watch his eye and see if he is accepting the process or tuning out. Young horses tune out easily and it can be difficult to see it happening. The saddle-cloth one day, then the saddle-cloth and saddle without girth the next, then the saddle-cloth, saddle and the girth the next again is a good speed of progression. You, or someone else is going to be putting the saddle on thousands of times throughout the horse's life. There is very little advantage in rushing the process and ending up with a difficult horse later on. Look at How to prevent bridle problems for a guide to resolving problems with horses who are already difficult.